The 475 additional U.S. military personnel headed to Iraq this week will assist Iraqi security forces as they take the offensive against ISIS fighters. They will be posted at Iraqi military headquarters to help coordinate military planning but will not see front-line action, according to U.S. officials. The new deployment to Iraq announced by President Obama Wednesday night will increase the number of U.S. military forces in that country to about 1,600. 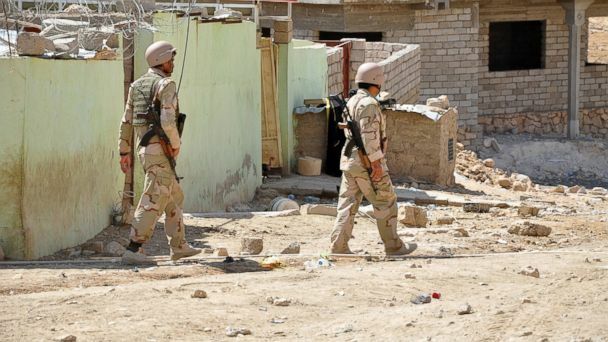 The U.S. first began sending U.S. military personnel to Iraq in June shortly after ISIS militants seized control of Mosul and large areas of northern Iraq. The new troops will arrive over the coming week to carry out a three-part mission: advising and assisting Iraq's security forces, supporting intelligence, surveillance and reconnaissance flights from Erbil in northern Iraq, and staffing a headquarters to coordinate U.S. military activities throughout Iraq. Pentagon Press Secretary Rear Admiral John Kirby said Wednesday that 150 advisors and support personnel will form a dozen teams that will embed with Iraqi security forces at the brigade level and above. They will not be involved in frontline combat situations. For several weeks U.S. military teams have worked with senior levels of the Iraqi military at Joint Operations Centers in Baghdad and Erbil. Another 125 personnel will support the operation of intelligence, surveillance and reconnaissance flights from Erbil in the Kurdish region of northern Iraq. Kirby said the aircrews and military personnel being sent there will support "manned and armed ISR platforms" that will fly from a base in Erbil. Kirby said sending the aircraft to Iraq "will free up some of the unmanned assets we have been using to conduct additional operations in the region." It is unclear what type of aircraft will make up this ISR team operating in Erbil. One U.S. official said they will not be Predator drones, but could potentially be fighter aircraft. Over the last few months the U.S. has used a variety of aircraft to gain intelligence in Iraq, including F/A-18 fighters from the carrier USS George HW Bush in the Persian Gulf. An additional 200 personnel will augment the headquarters elements operating in Baghdad and Erbil. A senior defense official said that the U.S. military stands ready to conduct "direct action" against ISIS targets inside Syria. "Decisions about when to conduct these actions will be made at a prudent time as we continue to prosecute our comprehensive strategy against these ISIL terrorists," said the official who used the alternative name for the militant group.